Draft: 2013, New York Mets, 1st rd. Dominic David Rene Smith graduated from Junipero Serra (CA) High School where he batted .493 (33-67) with seven home runs and 38 RBI in 27 games...Helped lead Serra to the CIF Division Three title in 2013...From ages 12-17, played for the Compton Youth RBI program sponsored by MLB...Helped underprivileged families go on a holiday shopping spree in 2017. Began the year on the Disabled List with a strained right quad...Optioned to Las Vegas (AAA) of the Pacific Coast League on April 15...Was with the Mets from May 11-14, June 12-July 20, August 19-20, August 20-24 and September 3 through the end of the year...Started 22 games at first base, 10 games in left field and one game as the designated hitter...Started in left field on June 19 at Colorado, his first major league start in the outfield...Batted .264 (19-72) with six doubles, four home runs, 10 RBI and eight runs scored in his last 28 games...Reached 10 home runs in his first 55 games with the Mets, fifthmost among players who started their career with the Mets through their first 55 games...Only Ron Swoboda (13), David Wright (12), Benny Agbayani (11) and Mike Jacobs (11) had more...Turned in a career-high three hits, including his first career triple, on June 20 at Colorado. Was promoted from Las Vegas (AAA) of the Pacific Coast League on August 11 and made his debut that night at Philadelphia...Named the Sterling Organizational Minor League Player of the Year...Picked up his first major league hit with a single on August 11 at Philadelphia...Connected on his first career major league homer on August 15 at Yankee Stadium (off Sonny Gray)...Is the second Met to hit his first career home run in the Subway Series...Kevin Plawecki was the first when he did so on April 25, 2015 off CC Sabathia at Yankee Stadium...Hit nine home runs in 49 games, the fifth-most in Mets history through 49 games for a player who began his career with the Mets...Trails Ron Swoboda (12), David Wright (11), Benny Agbayani (11) and Mike Jacobs (11)...After making his MLB debut on August 11, he led the Mets in RBI (26) and home runs (nine) in that time...Smith (22 years, 61 days) and Amed Rosario (21 years, 268 days) both homered on August 15 and are the first pair of Mets under the age of 23 to homer in the same game since David Wright (22 years, 247 days) and José Reyes (22 years, 74 days) did so on August 24, 2005 in the Mets' 18-4 win at Arizona...Delivered his first career pinch-hit homer with his three-run homer in the 7th inning on September 27 vs. Atlanta...The three RBI were a season/career-high...Homered in back-to-back games twice after joining the Mets (September 13-14 and September 27 and 29)...Hit six home runs and drove in 18 runs during September...The six home runs in September were tied for the team lead with Travis d'Arnaud and José Reyes...Smith is the fourth rookie in Mets history to hit at least six home runs in one season in September and October...The others were Gregg Jefferies (eight in 1989), David Wright (seven in 2004) and Mike Jacobs (seven in 2005)...Research courtesy of Elias...Batted .330 (151-457) with 34 doubles, two triples, 16 home runs, 76 RBI and 77 runs scored in 114 games for the 51s...At the time of his promotion, Smith was among the PCL leaders in hits (151, first), doubles (34, first), total bases (237, second), runs scored (77, tied for fourth) and average (.330, seventh)...Was the Pacific Coast League Player of the Month for July after hitting .385 (42-109) and led the PCL in July with 28 runs scored...His 21 extra-base hits, total bases (79), slugging percentage (.725) and OPS (1.162) were second-best in the league during the month...Hit eight homers and drove in 26 during July...Had a 19-game hitting streak from June 13-July 3 where he batted .361 (26-72)...Also had a 13-game streak from July 5-21 (.426, 23-54). Invited to his first MLB Spring Training...Won the Sterling Award for Binghamton, emblematic of the top player on his team...Finished among the Eastern League leaders in average (.302, eighth), RBI (91, third), and hits (146, third)...Set career-highs in hits (146), triples (two), home runs (14) and RBI (91)...Participated in the SiriusXM Futures Game in San Diego...Went 0-4 with an RBI for Team USA...Batted .429 (21-49) during a 12-game hitting streak from July 31-August 14. Named the Florida State League's Player of the Year...Led the league in RBI and doubles, was third with a .417 slugging percentage, fourth in batting average (.305) and tied for fourth in hits (139)...Won the Sterling Award, emblematic of the top player on his St. Lucie team...Named to the Florida State League post-season All-Star team...Participated in the Arizona Fall League following the season as a first baseman for Salt River...Hit .362 (17-47) in 14 games for the Rafters...Was named to the Arizona Fall League Rising Stars team. Won the Sterling Award, emblematic of the top player on his Gulf Coast League team. October 13, 2018 1B Dominic Smith assigned to Toros del Este. October 13, 2018 Toros del Este placed 1B Dominic Smith on the reserve list. September 3, 2018 New York Mets recalled 1B Dominic Smith from Las Vegas 51s. August 24, 2018 New York Mets optioned 1B Dominic Smith to Las Vegas 51s. 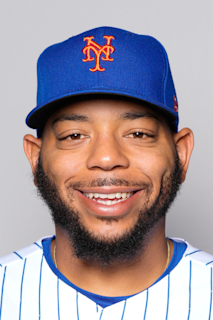 August 20, 2018 1B Dominic Smith returned to Las Vegas 51s from New York Mets. August 20, 2018 New York Mets recalled Dominic Smith from Las Vegas 51s. August 19, 2018 New York Mets recalled Dominic Smith from Las Vegas 51s. July 20, 2018 New York Mets optioned 1B Dominic Smith to Las Vegas 51s. June 12, 2018 New York Mets recalled Dominic Smith from Las Vegas 51s. May 14, 2018 New York Mets optioned 1B Dominic Smith to Las Vegas 51s. May 11, 2018 New York Mets recalled Dominic Smith from Las Vegas 51s. April 15, 2018 New York Mets optioned 1B Dominic Smith to Las Vegas 51s. April 15, 2018 New York Mets reassigned 1B Dominic Smith to the minor leagues. April 5, 2018 New York Mets sent 1B Dominic Smith on a rehab assignment to Las Vegas 51s. March 29, 2018 New York Mets placed 1B Dominic Smith on the 10-day disabled list retroactive to March 26, 2018. Strained right quad. August 11, 2017 New York Mets selected the contract of 1B Dominic Smith from Las Vegas 51s. April 3, 2017 1B Dominic Smith assigned to Las Vegas 51s from Binghamton Rumble Ponies. March 30, 2017 1B Dominic Smith assigned to Las Vegas 51s. January 11, 2017 New York Mets invited non-roster 1B Dominic Smith to spring training. July 14, 2016 Binghamton Mets activated 1B Dominic Smith from the temporarily inactive list. July 8, 2016 Binghamton Mets placed 1B Dominic Smith on the temporarily inactive list. April 6, 2016 1B Dominic Smith assigned to Binghamton Mets from St. Lucie Mets. February 17, 2016 New York Mets invited non-roster 1B Dominic Smith to spring training. September 16, 2015 1B Dominic Smith assigned to Salt River Rafters. May 2, 2015 St. Lucie Mets activated 1B Dominic Smith from the 7-day disabled list. April 26, 2015 St. Lucie Mets placed 1B Dominic Smith on the 7-day disabled list. Ankle injury. April 3, 2015 1B Dominic Smith assigned to St. Lucie Mets from Savannah Sand Gnats. March 19, 2015 1B Dominic Smith assigned to New York Mets. March 30, 2014 1B Dominic Smith assigned to Savannah Sand Gnats from Kingsport Mets. March 15, 2014 1B Dominic Smith assigned to New York Mets. August 28, 2013 1B Dominic Smith assigned to Kingsport Mets from GCL Mets. June 20, 2013 Dominic Smith assigned to GCL Mets. June 19, 2013 New York Mets signed 1B Dominic Smith.